South Trail System is still very low on snow. Trail is ridable south of Groat road but thin on snow. Trails were cleared of all fallen trees but recent windstorms have likely downed more on the trail. Also creek crossings have not been filled with snow. Use extreme caution if riding trails until we get some more snow. NE Trail System: East of hiway 32 and north of the Athabasca river:Trail cleaning was completed late this fall and at that time all fallen trees were cleared from the trail. Since then we have had a few major wind storms so it is likely there are a few downed trees across our trails. Snow conditions are poor at best however people are still venturing out onto the trail systems. Caution is advised as low snow cover has not covered up low lying hazards and trail grooming has not started yet. Watch for fallen trees on the trail. NW Trail System: Repairs made to creek crossings East of the Gundy Cabin on the Golden Triangle & South of Highway 43 on the Manweiler Trail after the large amount of rain washed away the banks this past summer. Also a new creek crossing at Carson Creek on the Carson Trail near Pipeline Hill due to the trail being washed away. A huge thanks to all volunteers that helped out during trail cleaning in November. The trails are all ready, we just need snow. After some trail scouting on the weekend, we still can’t find any snow. The snow in Virginia Hills has all melted and Dan’s skags and hifax took a beating. Rain and wind took away any snow that was out there. Eagle River Staging Area and trails are open. Limited snow cover with no new snow for a long time. Creeks and rivers are still open in many areas. Not enough snow to groom yet. Many natural hazards still exist so use caution. Please buy a trail pass to support where you ride!! Only 150 sold to date and we have waaaaaay more sleds than that around Whitecourt. Thank you for your support. That’s right they are cleared and ready to go and the gates at Eagle River Staging area are open. Thank you to all of the volunteers who spent more than 840 hours getting it done. We all appreciate your hard work and dedication so that we can enjoy these amazing trails. There hasn’t been a very substantial snow fall as of yet, so we want to remind everyone to use extreme caution. To Spruceland Ford for showing the 2012 Poker Rally Sled for raffle in their showroom and for purchasing a raffle ticket for all those who took a test drive that week. Your support to our club is greatly appreciated! I mean meeting time, but we get a party after! 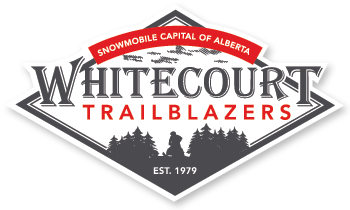 Next meeting will be on Wednesday, December 14th at the Whitecourt Legion (downstairs) @ 7:30pm. Bring your spouse and enjoy some Christmas Cheer!